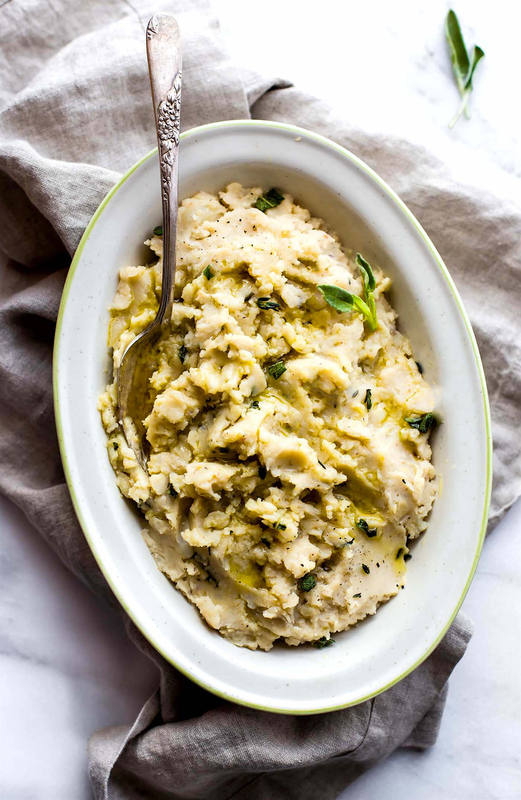 Vegan mashed potatoes made with a creamy white bean puree! A simple slow cooker mashed potatoes recipe with healthy white beans cooked in to give extra flavor and texture. These creamy mashed potatoes are delicious, even without butter! A vegan side dish crock pot recipe that everyone will enjoy! 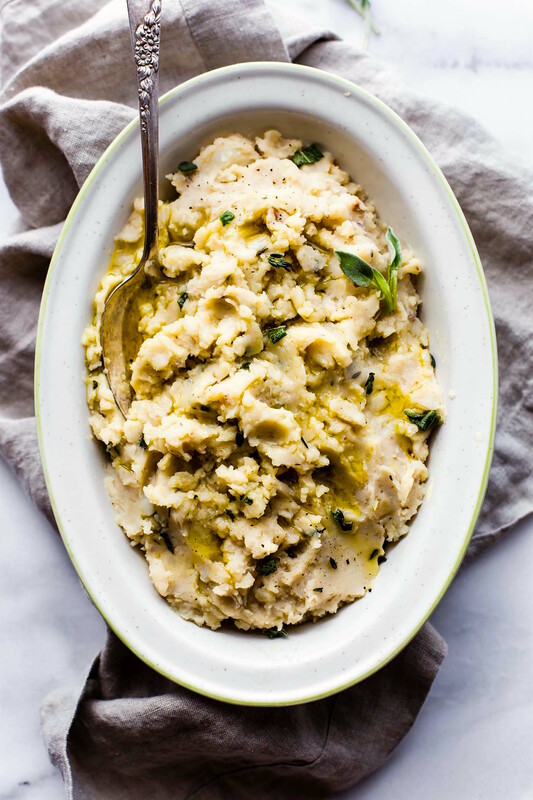 This white bean vegan mashed potatoes recipe is sponsored by my friends over at USA Pulses Thank you for allowing me to talk about this caring real food company. So I’m just gonna finish the week with another healthy comfort food recipe. A week of cozy delicious meals (pie bars and chili) and a big corny Cotter hug! All is welcome around my table! Mmm k? And guess what? 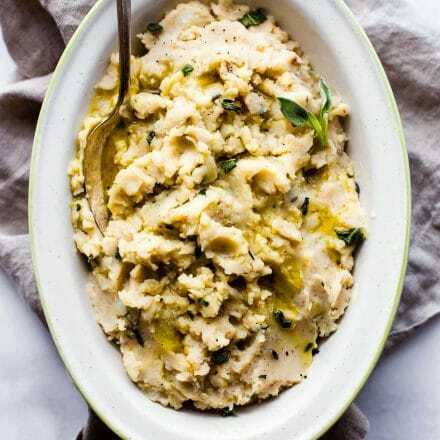 Today’s vegan white bean slow cooker mashed potatoes recipe is a total comfort food crowd pleaser, in more ways than one. Vegan, yes. Easy, yes. Delicious, yes. 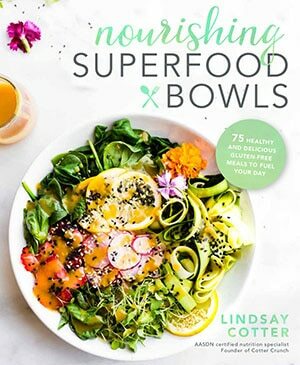 Nourishing, oh heck yes! I have so much to say about this winning nutrient combo I could squeal! Eeek! My inner nutrition nerd rejoices at the resistant starch combo. 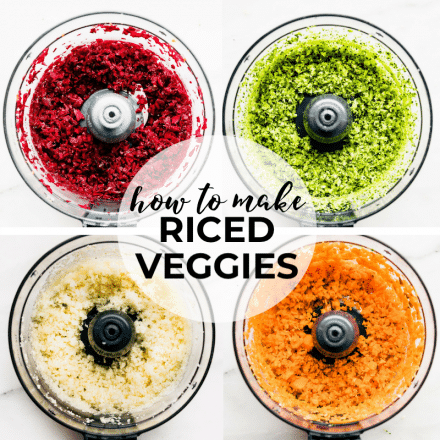 My inner people pleaser rejoices at the vegan (how to) food hack I’m about to mention! Yep, a creamy buttery vegan mashed potato flavor creation all because of white beans (pulses) and the magic of a slow cooker. Did you read that? Vegan mashed potatoes made with white beans are actually good for the gut flora and and they’re buttery??? How so!? Oh as I mentioned above, come sit at my table, cozy up, and let me feed you while I explain (and boast) and this winning mashed potato combo. Cool? White beans are pulses. Wait what? A pulse? Yes Pulses are part of the legume family! But the term “pulse” refers only to the dried seed portion of the legume. Dried peas, edible beans, lentils and chickpeas are the most common varieties of pulses. But… that’s not all folks. 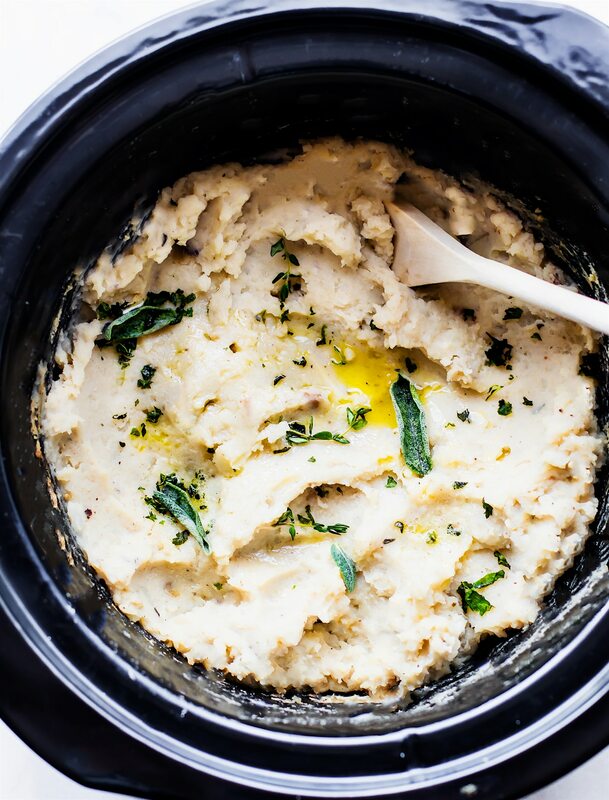 WHITE BEANS and slow cooker mashed potatoes make magic in 2 other ways. One, if you puree white beans. Like I did here with olive oil, garlic, and herbs, then add them to the slow cooker mashed potatoes, you will get a BUTTERY creamy taste. Buttery without butter. Have I used the word buttery enough? Haha, it’s glorious! 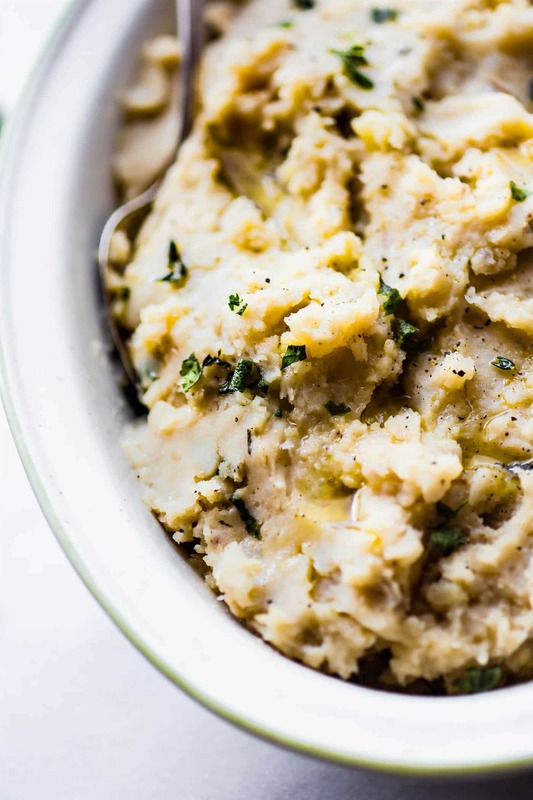 A slow cooker vegan mashed potatoes recipe that turns out extra creamy and extra flavorful! Did you know this? Heck, this white bean puree substitute even works in baking. Blend your white beans into you a puree and use it in place of butter. 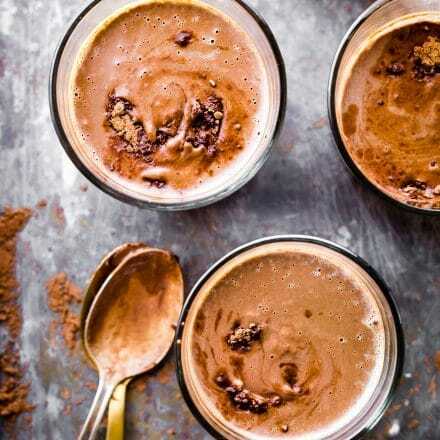 This is one of my favorite vegan food hacks to make during the holidays because no one can guess they are dairy free. Gasp! Oh and it also works for replacing butter in bread or cookies too! Okay but we’re still talking about buttery vegan mashed potatoes here. The perfect comfort food side dish that is actually quite nourishing. Yes, did you know that the combination of white bean puree and slow cooked mashed potatoes can actually help you gut? It’s true! And probably a NEED when you’re devouring your Thanksgiving meal. Watch this super quick recipe video and learn how to make the white bean vegan mashed potatoes! The truth is that white bean and white potato (cooked than cooled) are a great form of resistant starch. This is a form of prebiotic fiber that is actually going to feed that GOOD bacteria in gut. That means, your gut flora is gonna eat it up and stay HEALTHY! A healthy gut flora equals good digestion. 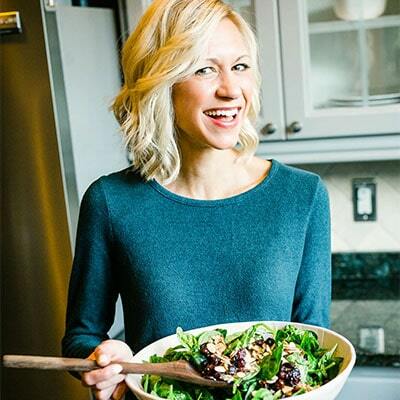 Good digestion equals better nutrient absorption and well …. an AWESOME immune system! So you see, an extra serving of vegan mashed potatoes just might do you some good on Thanksgiving, or any day! I like that concept. Don’t you? I sense you nodding your head. Fear not, carbs are good! Finally! Okay okay, let’s stop the nutrition nerd talk and jump to the slow cooker mashed potatoes recipe. You know, so you can oooooooh and ahhhh over it even more. Get your gut ready for some slow cooked goodness! Creamy herbilicious vegan white bean mashed potato goodness. Herbilicious is a word. I promise. 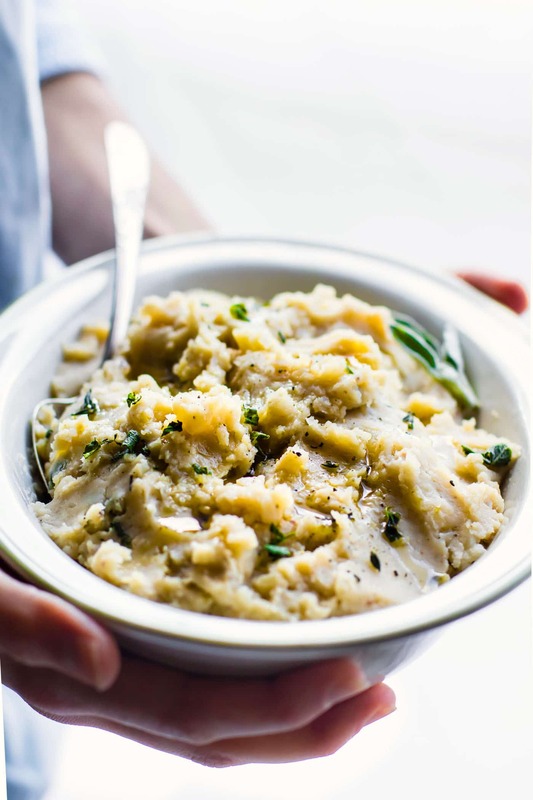 Slow cooker mashed potatoes that are vegan, thanks to a white bean puree that’s used to make them creamy without the use of butter! Extra oil if needed or 2-4 tbsp Coconut or almond milk to thin out. Wash and peel your potatoes. Place in slow cooker. Next make your white bean puree. 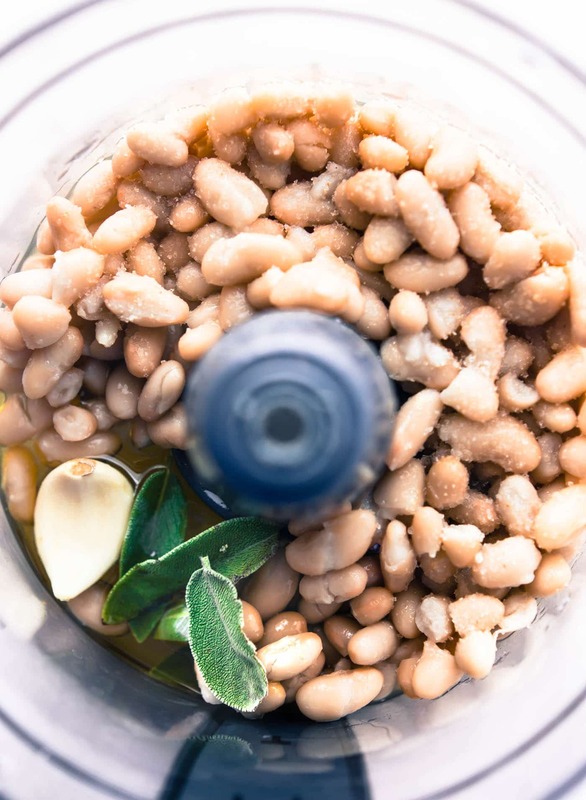 Place beans, oil, broth, sage leaves (stems removed), oil, 2 small garlic cloves (peeled), salt, pepper, and oil in blender or food processor. Blend until creamy. Taste and see if it’s to your liking. Add more salt/pepper/seasoning again if desired. Set aside. Next add 1/2 cups broth, 1/2 cup almond milk, 1 tsp garlic minced, 1/4 tsp sea salt and pepper, and 1 shallot sliced to your potatoes in the slow cooker. Mix all together. Now pour your white bean puree on top of the potatoes in the slow cooker/crock pot with a couple pieces of herbs/sage on top. Chop any extra herbs and/or sage into pieces. Set aside. Be sure to remove stems from herbs if you placed any on top of cooked potatoes. You can do this half way or at the end of cooking. After potatoes have softened enough, mash first with masher in the crock pot. Then take an Immersion Blender and Blend in slow cooker until smooth. See notes if you don’t have an emersion blender. If potatoes are too thick, add more oil or 2-4 tbsp of coconut milk or almond milk to thin out. Last Fold in herbs (as little or as much as desired). 1/2 tsp sea Salt or garlic salt and pepper or to taste. If you don’t have an immersion blender, you can continue to mash with masher, or place cooked mashed potatoes in a blender. Add a little broth or milk (2-4 tbsp) and blend until creamy. Immersion Blender work best though. Now let’s get up close and personal with these magical vegan mashed potatoes! Ahhhh yes! White Bean Magic! 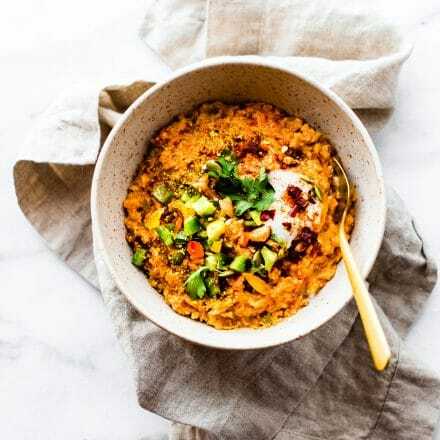 Looking to add more nutritious pulses to your diet? Join me in taking the Pulse Pledge! You’ll receive free recipes, cooking tips and more. 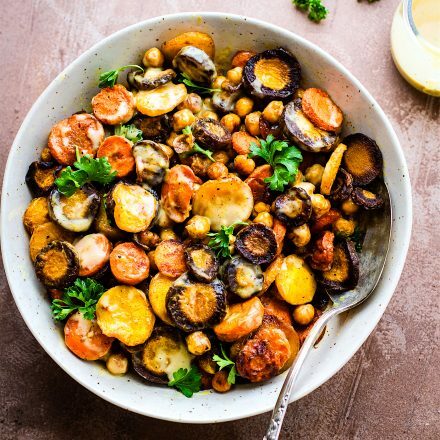 More Gluten Free Vegan Recipes that Use Pulses! 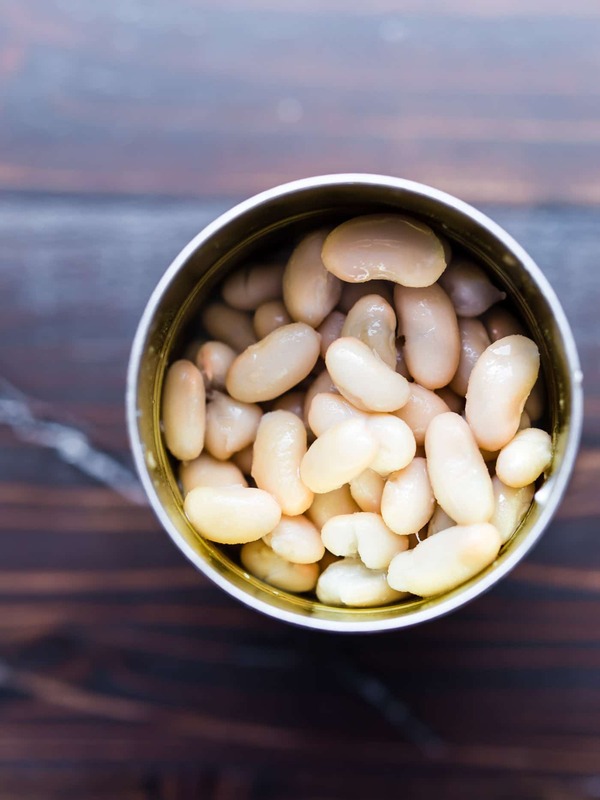 Have you ever used white beans (or any pulses) in cooking/baking? it so is!! let me know if you try it Mollie! Ooo beans potatoes, all that sage….swoon! All that comfort and warmth <3 Much needed! whoops I totally forgot to change the end question. haha! I was like, why is talking about pies when the recipe is mashed potatoes? LOL! my brain. Yum yum yum. Pinned for later! I’m not a fan of mashed potatoes (other than sweet potatoes) but I’d definitely give these a try! I think I need to attend your Thanksgiving! Soooo… I absolutely HATE white potatoes. Weird, I know. But you may have just created a recipe I like. I love the flavors, and I’m a huge cannelloni fan. It’s a sign. We need to move in together in NZ. yes, i will make sure to have wine, sweet potatoes too, and white beans! It’s on! yes! love that hummus too! just think, that creaminess with potatoes. swooooooooon! you don’t even understand how much I love potatoes and get so sad at the holidays because everyone makes them with butter and I can’t. WHOOP I’ll need to volunteer to bring them! Thank you for schooling me on pulses vs legumes, my friend! These look amazing and so flavourful – I’m salivating at the thought of what they’ll taste like! And for super healing powers, I vote bone broth! Oooh! What a clever recipe! I’ve got to try this! thanks friend! Let me know if you do! The whole description of this plus all the nutrition facts totally makes me want to try this. I have a few gut issues, and any help I can get on them especially with the foods I eat is much appreciated. :))) I’m so thankful God made so many different foods that can help our bodies in different ways. You are on fire with all the slow cooker comfort! This sounds soooooo goooooooddddd. Thanks Cora! I do love my slow cooker. haha. like OBSESSED! LOL! I so thought of you! I know You’ll love this! Let me know if you try it alisa! thanks friend! haha i have BEAN known to do that. LOL! I am totally nodding my head and you know how I feel about butter. I love using white beans to get a creamy buttery finish. I use them in a Cheesy Artichoke Dip and they’re magic. I’ve been trying to eat much more beans, so this is amazing! 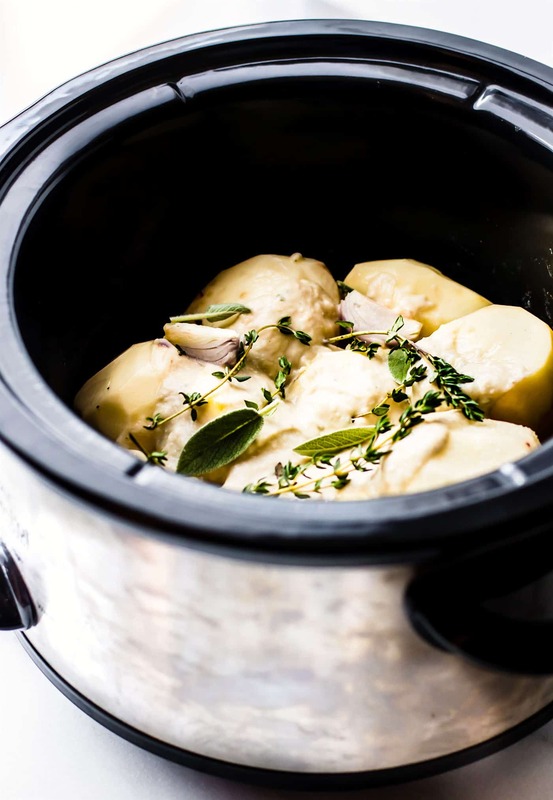 I love that this recipe is secretly protein packed and can be made in the slow cooker! Delicious! White bean mashed potatoes sound amazing! Need to add that to our Thanksgiving menu! oh yay! keep me posted on how it turns out! Should I dice the potatoes before putting them in the cooker?